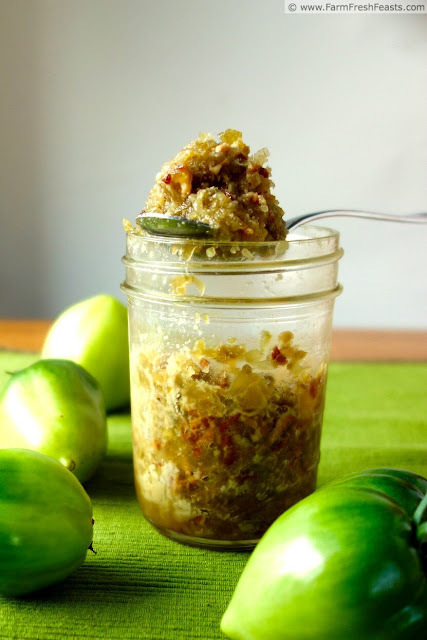 A savory freezer jam made with green tomatoes, sweet onion, and crispy bacon. This is AMAZING mixed with ground beef for burgers. If you're new here, welcome! I blog about feeding my family seasonal produce from our CSA farm share, our garden, or good deals I find. I like to cook based on what I have available, so I created my Visual Recipe Index by Ingredient (vegetable, or fruit, or fungus) which you can find in the pages across the top. 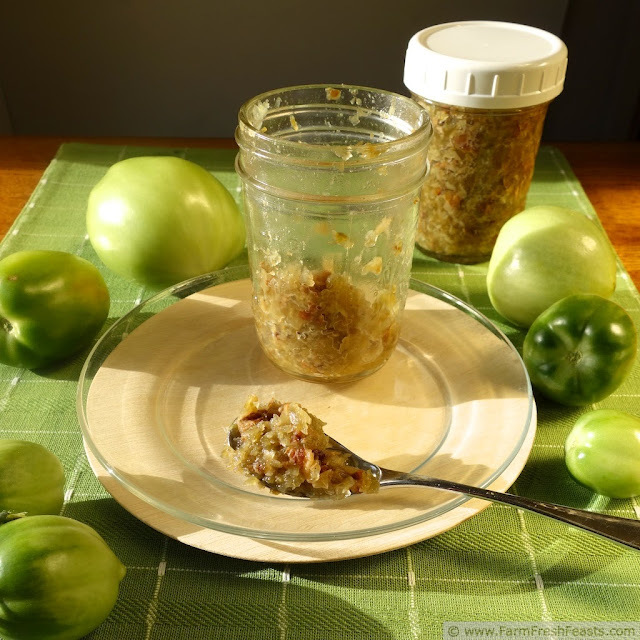 For more recipes using green tomatoes, please check out my Green Tomato Recipe Collection. When I started this blog I didn't fully appreciate the versatility of a green, unripe, tomato. I liked to eat fried green tomatoes and hadn't ventured from there. Then a friend shared her Slow Cooker Green Tomato Garlic Chili recipe and I thought I'd dabble in more green tomato recipes. I've got 10 posted--so far! I decided to make jam with green tomatoes from sheer curiosity. 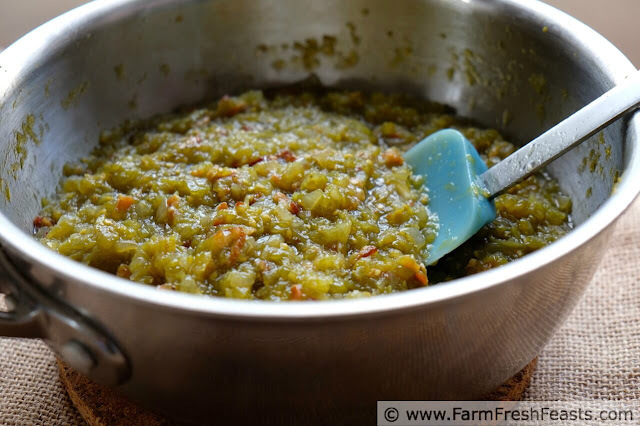 I saw sweet green tomato jam recipes, and savory red tomato and tomato bacon jam recipes, but I didn't find a savory green tomato bacon jam recipe. 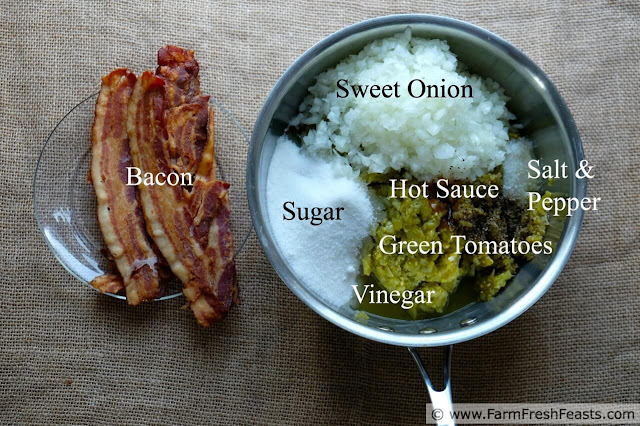 I started with this recipe and swapped out the red tomato for a bit larger volume of green tomatoes and onion. If you grow tomatoes or know someone who does, keep this recipe in mind as the nights get cooler (as tomatoes don't ripen if it's too cool at night). Sure, you can pick tomatoes and ripen them on the counter, but aren't you getting a wee bit satiated by ripe summer tomatoes? Are you looking for a little something different? My answers to those questions are yes and yes, so I'm sharing this today. Make this jam when your tomato crop is in danger of succumbing to frost. Store the excess jars in the freezer. Next time you're making burgers, mix 1/4 cup of jam in with a pound of ground meat (I've used beef and turkey so far) then continue with your usual burger making. 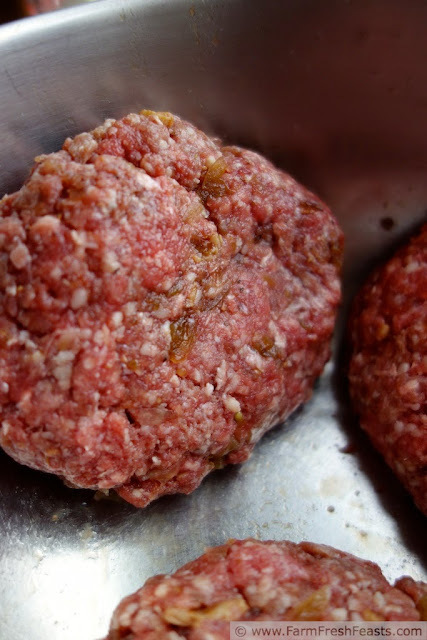 I prefer to make quarter pound burgers because I get plenty of protein and sure don't need the bigger burger, and I can make 1 pound of ground meat easily feed our family of 4 on burger nights. For more recipes using green tomatoes, please see my Green Tomato Recipes Collection. It's part of the Visual Recipe Index by Ingredient, a resource for folks like me eating from the farm share, the farmer's market, the garden, the neighbor's garden, and great deals on ugly produce at the grocery store. This jam provides that little something extra that elevates a good burger--beyond. I've enjoyed it other ways (clockwise from upper left corner, ending in the center): turkey sliders, on a baguette (also good on a cracker with cream cheese), on a gyro, on a burger (served with Confetti Potato Salad), chopped green tomatoes can be frozen, you have no idea how many green tomato bacon jam photo shoots I've had, burgers and more burgers, and for a double tomato whammy, on a tomato and mozzarella sandwich. Not pictured but also enjoyed: spread on toasted bread and used in a club sandwich. A savory freezer jam made with green tomatoes, sweet onion, and crispy bacon. The easy way to do this is just core the tomatoes and toss them in the food processor, pulse a few times, then quarter the onion and throw that in, and pulse a bunch until it's all pretty finely chopped. If you prefer to polish your knife skills or don't own a food processor, just finely chop both the tomato and the onion. Dump the veggies in a 3 qt saucepan, add the sugar, vinegar, and seasonings, and stir well. Bring to a boil over medium-high heat, stirring often. Reduce heat to medium, stir in bacon, and cook until thickened and jammy (about an hour). Stir every 5 minutes or so (this isn't risotto, but don't just forget about it). Taste and adjust seasonings to your liking (more salt? more vinegar? more sugar?). Transfer to jars when cool. This makes 2 pints (4 half pint jars) for me, but you may get a little more or less depending on how thick you cook your jam down. I store most of the jars in the freezer (up to 6 months) and have one working jar in the fridge. 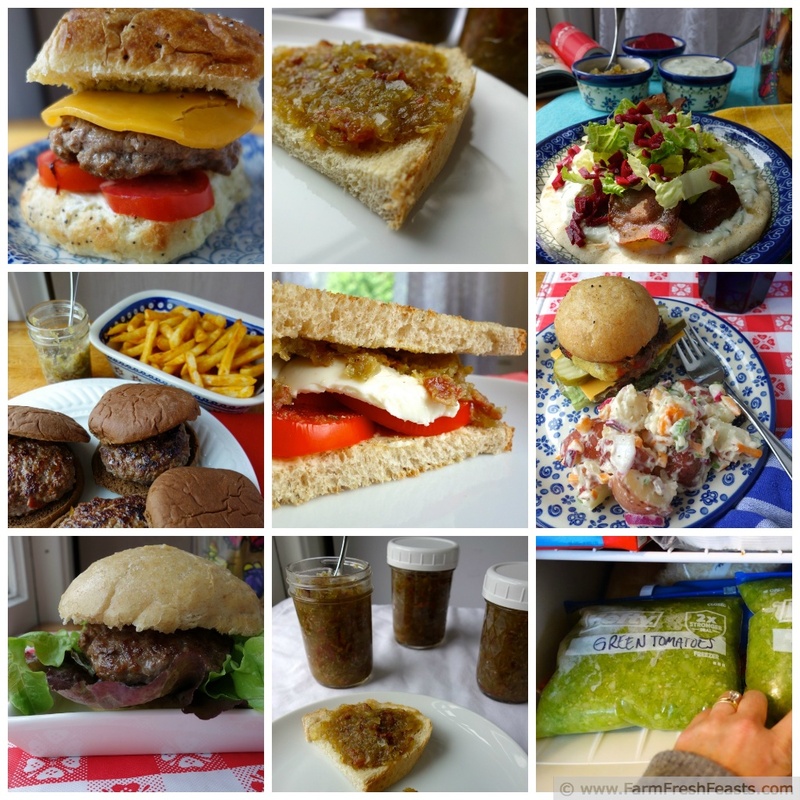 For burgers, 1 tablespoon per quarter pound burger tastes delicious to my family. Just add the jam to the ground meat, then season, shape, and cook the patties as you normally prefer. This sounds sooo good, Kirsten! I love the idea of bacon in jam. I recently saw a recipe for cherry bacon jam, and I want to try that one too. I guess it's time to stock up on bacon! It's always a good time to stock up on bacon :) .Cherry bacon jam sounds good-I bet it has that sweet salty thing going on. For me, once the nights cool the tomatoes become very slow to ripen, but I'm hoping for a long growing season this fall so that I may have some fresh ones still when my spouse comes home. Kirsten: I have thought about making a bacon jam many times but yours looks scrum-didli-umptious. You're so creative, I bet you'd make a delicious bacon jam . . . maybe with ginger, since you're on a ginger kick? You made BLT's in jam form! And then put it on a burger! That's pretty clever, and I know the Hubby would be a huge fan. If I ever were to rejoin the carnivores club, it'd be with this jam or anything involving bacon. Bacon. It's a wonderful thing. I'm curious what my spouse does when he returns--will he become carnivorous again? Only time will tell. He doesn't feel as strongly as I do about bacon. I know we will have green tomatoes at the end of the season. I made chutney last year, but I wasn't crazy about it. Bacon jam may be the answer. Thanks for the recipe! This jam--in a burger. I'm drooling typing this, just remembering the flavor. Oh, Kirsten, you just come up with the greatest recipes. I have to do this next month when my tomatoes finally succumb. I usually get four or five pounds of them, just before the first frost. I still have a few packages of venison in the freezer. This may be the perfect complement to venison sliders. I do a mean pulled venison with slaw and BBQ sauce. This would really put it over the top. A pulled venison slider sounds really delicious to me, and yes, this would be delicious on it. Please blog about it so I can share vicariously! I love bacon...in fact, my entire family does. Which means...this needs to be made pronto! Bacon . . . it's what's for breakfast in the morning, since I've not had enough tomato sandwiches this week--gotta meet my quota. Very creative use of green tomatoes, Kirsten! Thanks for sharing with the Clever Chicks! And the burgers made with this are yummy. Thanks for hosting! This came out pretty good, I added some dark brown sugar, maple syrup, espresso powder, smoked paprika, tomatillos and substituted bourbon smoked salt and it came out great. It works wonders as a hot viniagrette on green beans before it thickens up too much! Oh my now you're making me drool--bourbon smoked salt sounds so incredible, and what great flavors you've got going on in there. Thanks for sharing your tweaks! My daughter and I are the new owners having purchased it about 3 weeks ago. We are checking all links as well as pinning to our new categories. I hope you will continue to submit to YG and look at our new categories - canning and preserving along with others that may better categorize foods for special diets or cooking processes. Congrats on your new venture! I fell out of the routine of submitting to all of the sites months ago, and it's one of my blogging new years resolutions--just like replying to comments *before* 5 months have elapsed is another! Just made this today - tastes so good it might not make it into jars! Thanks for the inspiration. I'm glad you liked it! I'd love to know how you're using it. Can't wait to try this. Can it be preserved preserved other way? That's a great question--thanks for asking! I'm positive that water bath canning is NOT safe, because of the bacon. I am not familiar enough with pressure canning to know what is and is not safe (I've only canned tomatoes and meat stock and I followed the recipes that came with the canner) so I cannot recommend that method. Often university extension offices are good places to check for the latest info on safe canning methods. A couple of good sites to start with are the National Center for Home Food Preservation http://nchfp.uga.edu/how/can_home.html , Ball jars canning website http://www.freshpreserving.com , and Food in Jars http://foodinjars.com .